The programme has now been released for our 18 March Geo: The Big 5 event – and it’s an incredibly exciting line-up. 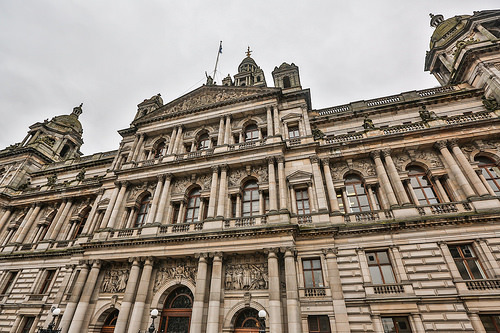 We are very pleased to announce that Councillor Gordon Matheson, Leader of Glasgow City Council will open the event, which is being held in Glasgow City Chambers. Of course, Glasgow City Council are leading the UK Future Cities Demonstrator project and with Future Cities the main theme of the day this we are delighted that Councillor Matheson is able to join us. We can also announce that Andrew Collinge (Assistant Director at the Greater London Authority) will be joining Professor Iain Stewart as a plenary speaker. Andrew will provide an introduction to our Future City theme with a look at how London is changing and the impact on spatial planning. TV’s face of geoscience and President of the Royal Scottish Geographical Society, Professor Stewart will close the day with a unique insight into the Future Cities landscape. As last year, the rest of event is multi-stream with a range of options to suit your interests. Chaired by Graham Colclough of Cities Protocol, our Future Cities stream will feature presentations from Future Cities Glasgow, Glasgow City Council, British Geological Survey and Scottish Power Energy Networks in addition to an exciting afternoon session that will be announced shortly. As well as the Future Cities stream, we are also be welcoming speakers from Angus Council, Scottish Water, Glasgow 2014 Commonwealth Games and Forestry Commission Scotland. Chaired by members of the AGI Scotland Committee, these speakers will give an inspiring overview of recent projects from their organisations as part of our Best Practice Stream. Finally, both Ordnance Survey and thinkWhere will be providing an opportunity for delegates to pick up practical experience in workshop sessions. It’s a great chance to find out more about open source GIS package QGIS and the Ordnance Survey Open Data and go back to the office with some new skills. Our exhibition area will also provide an opportunity to find out about the latest innovations in geographic information and tools, in addition to providing a fantastic opportunity to network with delegates, speakers and sponsors. The AGI Scotland event is a highlight in the year and the volunteer event team have worked hard to ensure that we can offer a fantastic programme while continuing to keep costs for delegates affordable (only £49 +VAT for members). Booking is open and it’s not long to go; please come and support us – we look forward to seeing you there! This event is sponsored by Ordnance Survey, ESRI UK and thinkWhere and supported by Kemeling Consulting. Sponsor opportunities are available now.